Chief Minister Conrad K Sangma visits the newly discovered Rongma Gitil Eco-Tourism destination in Kharkutta on Sunday. 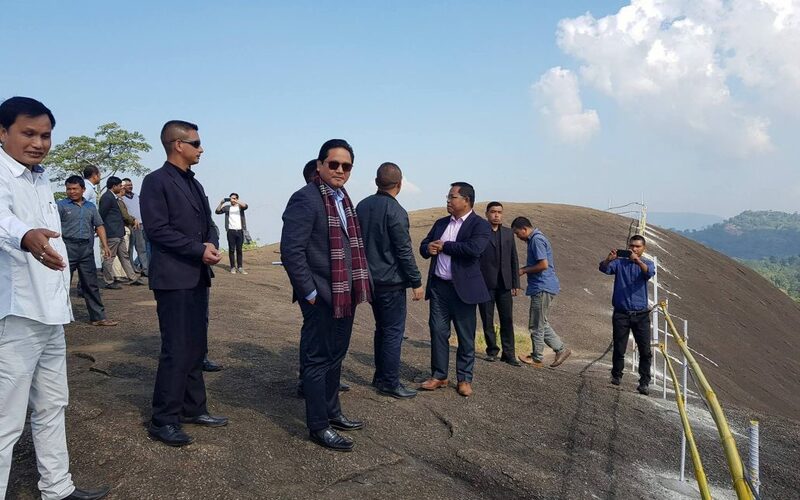 Meghalaya Chief Minister Conrad K Sangma on Saturday visited the newly discovered Rongma Gitil Eco-Tourism destination in Kharkutta, North Garo Hills, where two-day tourism festival was underway. Thrilled with the potential of Rongma Gitil, which has all the ingredients to be promoted as an eco and adventure tourism destination, the Chief Minister announced Rs. 50 lakh assistance to initially develop the destination. He said that through different line departments the site would be developed and promoted in the next few years. “I am bowled with the mesmerizing beauty of Rongma Gitil and the stone cave in the area. I thank the local MLA Rupert Momin for initiating to develop the spot as a tourism destination,” he said. He informed that Rs. 300 crore was sanctioned by the Government of India for promotion and development of tourism destination in Meghalaya of which Rs. 100 crore will be exclusively used to develop select destinations in Garo Hills. “Tourism will boost the image of the state as well as provide work for the local populace. We have to integrate tourism activities with a view to provide employment and development of entrepreneurship,” he added. The Chief Minister pointed out to the people that places like Goa, Sikkim have very similar topographical characteristics, weather and vegetation, and that these places have very high per capita income in terms of tourism and tourism related services. “The youth has to come forward to look at tourism as an alternative livelihood option. The government is working hard to adopt policies to ensure that livelihood opportunities are created in the tourism sector vis-à-vis attract high tourist footfall in Meghalaya,” he said. He also informed that funds for tourism sector have been enhanced for Meghalaya in view of promoting tourism in the State. “Tourism cannot develop without proper communication in terms of road connectivity and that in order to develop such connectivity, under PMGSY the budget has gone up from the previous 150 crores to 500 crores,” he added. The Chief Minister also said that about 18,000 crores has also been allocated for the development of National Highways which will help in promoting tourism as road connectivity is the foundation of all forms of development. The Chief Minister also said that North Garo Hills has also been allocated about 253 Crores for all-round development. Food processing namely banana, pineapple, oranges have also been given priority and that Kharkutta has been allocated about 2 crores for the same.